elitism -- Dictionary definitions didn't help me. I went here, but I got overwhelmed. Seems like Trump considered it a useful argument to vote for him. Not sure that he sees it as useful now. thread the needle -- (Heard repeatedly from the press and guests.) Context is everything here: Finding harmony or striking a balance between conflicting forces, interests, etc. double down -- (Heard repeatedly from the press and guests.) To become more tenacious, zealous, or resolute in a position or undertaking. Not what I want my politicians doing with every lie they're caught in, but, you know, Trump. And Conway. And Spicer. alt-right -- The Alternative Right, commonly known as the Alt-Right, is a set of far-right ideologies, groups and individuals whose core belief is that “white identity” is under attack by multicultural forces using “political correctness” and “social justice” to undermine white people and “their” civilization. Characterized by heavy use of social media and online memes, Alt-Righters eschew “establishment” conservatism, skew young, and embrace white ethno-nationalism as a fundamental value. Gotta love the Southern Poverty Law Center and its excellent post explaining this in more detail. Oh, and then there's Stephen Bannon here and here and here. white nationalism and white supremacy -- The New York Times defines these concepts well. minority president -- From George Lakoff: Hillary Clinton won the majority of votes in this year’s presidential election. The loser, for the majority of voters, will now be a minority president-elect. Don’t let anyone forget it. Keep referring to Trump as the minority president, Mr. Minority and the overall Loser. Constant repetition, with discussion in the media and over social media, questions the legitimacy of the minority president to ignore the values of the majority. The majority, at the very least, needs to keep its values in the public eye and view the minority president’s action through majority American values. Narcissistic Personality Disorder -- There's no joke here. Just the President of the United States. the dog that caught the bus -- So now what? 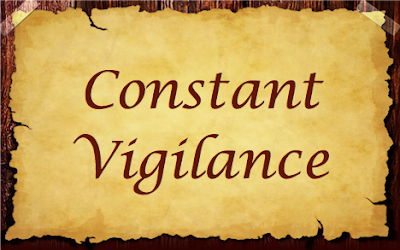 Personal motto, formerly applied to all things special education, now applied to politics: Constant Vigilance. Tape it to the wall. Welcome to my blog! I have been married for 27 years and have two children, 19 and 17. I used to teach English as a Second Language back in Philadelphia, but here in Southern Maryland, I am a perpetual volunteer. My blog is meant for me, but maybe it'll bring something to you, too. As you would expect, all material on this website is copyright protected © 2017. All rights reserved.